The inns and outs of town’s public houses | The Dacorum Heritage Trust Ltd. The Coach and Horses was once situated at No. 86, on the west side of the High Street. This beer house, mainly patronised by tramps and labourers, managed to keep trading until 1914. Further on, the Brewers Arms, was situated at Nos. 76-78 and continued trading as a common lodging house well into the twentieth century. The Old Kings Head, another beer house, was at No. 66 and according to Kelly’s Directory it was still operating in 1882. However, the pub frequently changed hands, which suggests that trade was poor, the customers being mainly down and outs. Henry Hall for example, the landlord at the time of the 1851 Census, is described by the enumerator as a ‘labourer’. Next door but one to the old King’s Head, at what is now Townend House, stood the Red Lion Inn. This establishment was also little more than a beer house with accommodation because, according to the 1851 Census, the nine lodgers were described as ‘labourers’. By the end of the nineteenth century the brewers, Chesham and Brackely, closed the pub in order to transfer the licence to the Midland Hotel, Hemel Hempstead. This old beer house, dating back to the sixteenth century was purchased by the Bailiwick in 1886 in order to construct further Bailiwick buildings on the site. Beyond the remaining White Hart was once the Dolphin, which stood on the site of the now closed National Westminster Bank. It appears to have been a small ale house, which disappeared at the end of the eighteenth century. 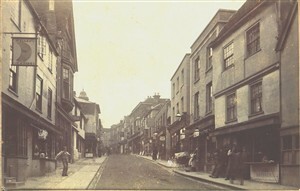 At the bottom of the west side of the High Street, at Nos. 24-26 stood the Half Moon Inn, which was established in the early eighteenth century. It offered little accommodation, but was enlarged in the following century. A bill of sale dated 1827 revealed that there were two bars, a kitchen and ‘four sleeping rooms’. 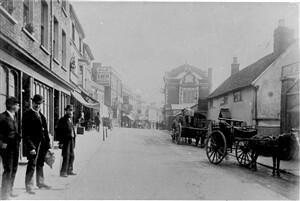 In 1901 the brewers, Wellers of Amersham, bought the Half Moon as a freehold public house, together with the shop next door. 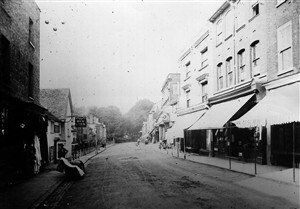 The property was later sold to William Frederick Williams, a greengrocer, the Half Moon having been closed on 31 December 1912. Sometimes it is very difficult to locate the exact sites of pub that have disappeared, as in the case of a pub referred to in an eighteenth century business transaction as the Shoulder of Mutton, once known as the Castle, which was situated at the lower end of the town. This could have been in Queensway, once part of the High Street. A poster advertising the sale of the George Inn by auction in 1791 is an example of a property being in the High Street, but with no indication of the exact location. When the business was sold, it probably ceased trading as an inn. As the east side of the High Street was overcrowded with inns and taverns, it is possible that the George was located on the west side. By the end of the nineteenth century all the pubs were bought by brewers who let the properties to tenants. Today, the brewers prefer to run the remaining pubs with managers and, in keeping with modern times, they are mostly theme pubs. The local licensed premises – whether as inns, pubs or beer houses – were an important feature in the daily life of the High Street, and all the buildings that they once occupied, together with the four remaining pubs, are now Grade II listed buildings. Many of the lost inns are now shops, restaurants or have been converted into attractive private houses, and, as one of Dacorum Borough Councils conservation areas, the High Street is now one of the most attractive streets in Hertfordshire.